Independence Palace (Belarusian: Палац Незалежнасцi) is palaced in Minsk, located on the Pieramožcaŭ Avenue, near the exhibition center "BelExpo" and the State Flag Square, not far from Victory Park. The purpose of the Palace of Independence is to host important and landmark events, and meetings of foreign delegations. STRUCTURE AND LAYOUT - The total area of the Palace of Independence is around 50,000 square meters, and includes several hundred rooms. RECENT EVENTS - The first official events in the palace were the meeting of the Supreme Eurasian Economic Council at the level of heads of state, and the meeting of the Council of CIS heads of state. The meeting on Ukraine crisis between presidents of Russia, Ukraine, Belarus, Kazakhstan and representatives of the EU was held at the Palace. 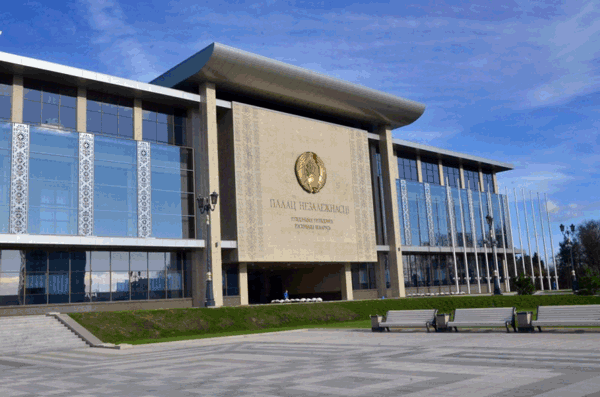 CUSTOMER: BELARUS PRESIDENT ADMINISTRATION (PALACE OF INDEPENDENCE)SECURITY TASK TO BE SOLVED - To secure the palace from intrusion coming from outside, protecting its external perimeter, detecting intruder before they could reach any strategic objects, persons, or assets. PRODUCT INVOLVED IN THE PROJECT - Absoulete Plus, this solution was ideally fulfilling all customer requirement about Highest security degree with a design that properly match with the image of a representative building like the Palace of Independence. NUMBER OF ZONE - In this project are involved 30 Absolute Plus dual technology barrier. SPECIFIC CUSTOMER REQUIREMENT WHICH HAS DELINEATED THE USE OF ABSOLUTE PLUS - Customer main target was to have a long term solution which could operate under any environment condition always ensuring a proper detection capability and a low nuisance alarm rate. CUSTOMER MAIN REASONS CHOOSING SICURIT ALARMITALIA S.P.A. & ATOMIUM-SECUTIY LTD - Main reasons have to be found in Sicurit experience in developing and producing device specially designed to protect highly sensitive site, and in its partners technical and products knowledge. All Sicurit authorized partners as Atomium-Security, have been properly trained and certified. TIME FROM THE BEGINNING TO THE END OF THE PROJECT - Project implementation has been last for approximately one and half year . CUSTOMER SATISFACTION - After a proper and accurate setting and adjustment job from our partner, the system is now operative, fully complying customer requirement and expectation. Sicurit partner for this project : Atomium-Secutiy Ltd – Minsk Project designer and integrator company working under Belarus Security market since 1997.